On each stage there are weapons you can pick up. There are also boxes and barrels that can be broken open, which can also reveal a weapon. Each weapon has a limited amount of uses or ammo. If you want to throw a weapon at the opponent, press the fierce punch and roundhouse kick buttons together. For whatever reason, if you do this with a weapon depleted of ammo or uses, and then pick it up, it will be re-filled and you can start using it again! The only weapon missing from this page is Belger's leg. 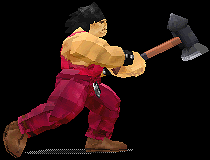 You can knock his leg off and use it as a weapon, with it acting similar to the war hammer. But I've tried and tried to knock his leg off and can't seem to do it, so no picture. You can only get this weapon by knocking one of Belger's arms off. 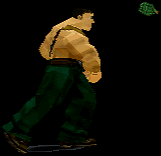 The arm acts like a club, with your character swinging it at the opponent. A short range knife. El Gado starts out each round with one of these. This large weapon will fire rockets at the opponent. If they hit, they will cause an explosion that will knock the opponent down. Bazooka's have 8 rockets inside them. You'll actually pick up several of these grenades, rather than just one. To throw them a long distance, hold the direction toward the opponent before pressing the fierce punch button. You can also lob them by holding the down forward direction and then pressing fierce punch. This weapon only appears on Belger's stage. It shoots explosive arrows. Your character will swipe at their opponent with this weapon. This is Damnd's best weapon, as it improves the reach of his cannon ball attack. Shoots a stream of fire. Hold up or down to control the direction the flame is shot. The flame thrower has 32 shots. 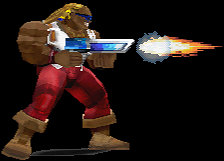 The gun fires projectiles which can briefly freeze the opponent. You'll need to fire very close at the opponent to take advantage of them in their frozen state, however. This gun has 16 shots. A standard handgun. Fires slowly and holds 8 bullets. You can only get this weapon from Belger. It acts as a grenade, so throw it at the opponent to cause an explosion. A slightly more powerful version of the army knife. Sodom's default weapon. Your character will swipe at their opponent with this. Guy will thrust at the opponent with it. 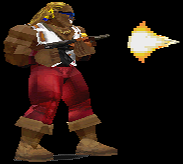 This gun has quite a bit of ammo to burn (48 bullets), so hold down the fierce punch button to keep firing. It can be aimed up or down by holding either of those directions whilst firing. A slightly more powerful version of the katana. This weapon is like Rolento's stick, but is longer so it has slightly better range. These will slightly extend the reach of your character's punches. However, for Poison, it will increase the damage her punches do, as well as adding an extra hit to her cat claw move. Edi. E's default weapon. This stick acts like the katana or steel pipe, but lacks their range due to it being shorter. This weapon is slow to fire, but the bullets do decent damage. It holds 16 bullets. Each time you fire this weapon, it will shoot out 3 projectiles which cover a wide range. The bullets are powerful, especially at close range. The shotgun has 10 shells inside it. These weapons will make your character's punches do a little more damage than usual. This weapon acts similarly to the katana. 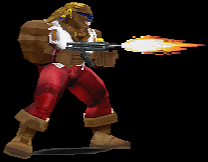 It is also Haggar's best weapon, as it was in the original Final Fight. He gains a special swipe attack when using it. This acts like the steel pipe, but isn't quite as good due to it having shorter range. It is also Rolento's default starting weapon. Has 10 shots. 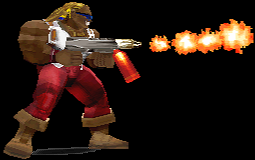 This gun doesn't actually stun the opponent of the bullets hit, as they will instead be knocked down. This acts like the other knifes, but Cody gets a double swipe attack when using it. 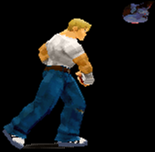 Whilst using Cody, hold down different directions on the d-pad and then press the fierce punch button to make him do different moves with it. This large weapon is very useful as it can stun the opponent in as little as 3 hits!